Sewing Life Skills Class at Tesh - Tesh, Inc.
One of the most requested Life Skills classes here at Tesh is the sewing class. Learning to sew brings a sense of self-sufficiency to every client. They experience enhanced self-confidence when they are able to mend a seam or sew on a button for themselves. Clients are encouraged to bring sewing projects in from home so we can assist them with repairs or alterations. Imagine the sense of pride a client feels when they are able to do a small sewing repair for a person at home who is just too busy to get to it. 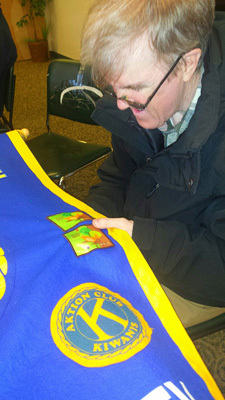 In this photo, Shawn Miller is sewing an “Early Bird” badge onto the Aktion Club banner. He smiles proudly when he say, “I did all the stitching on my own.” Shawn has learned remarkably accurate stitching skills: each stitch is uniform in size and spacing. He laughs when we tease him about how lucky his girlfriend is because of all the sewing gifts he creates for her. If your button falls off, you know who to call. © Copyright 2019 Tesh, Inc. - All Rights Reserved.